Intel is weighing acquiring rival chipmaker Broadcom for over $100 billion, should the latter company appear likely to acquire Qualcomm for $117bn, The Wall Street Journal reports. The move is far from guaranteed, people familiar with the matter cautioned, but Intel has been considering the acquisition since late last year and is working with advisors. Broadcom initially announced its intention to buy Qualcomm back in November 2017, but has faced opposition from both Qualcomm and regulatory bodies. Meanwhile, Qualcomm is in the midst of trying to buy European semiconductor company NXP, which Qualcomm agreed to purchase in 2016 for $38bn but was unable to, due to an ongoing antitrust investigation. NXP itself acquired US-based Freescale Semiconductor the year before, for $11.8bn. Last month, Qualcomm updated its offer to $44bn. Intel is reportedly eager for the Broadcom-Qualcomm deal to fail, fearing the combined company could be a significant threat to its business. But should it look like the acquisition will succeed, Intel is considering the expensive takeover (Broadcom’s market value is about $104bn), or a series of smaller acquisitions. Among Intel’s concerns is that the acquisition would allow Qualcomm to repair its frayed relationship with Apple - one which has fallen apart in recent years over licensing disputes. Both companies are currently suing each other, with Apple seeking $1bn in the US, and Qualcomm trying to ban iPhones from sale in the US and China. 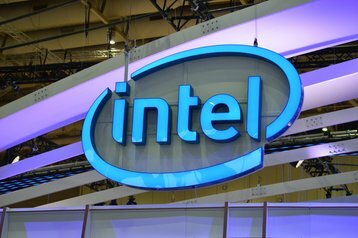 A new owner could draw a line under the escalating conflict, shutting down Intel’s most promising avenue towards market share in the mobile space. Since the iPhone 7, Apple has shared baseband chip orders between Qualcomm and Intel, and is thought to be trying to decrease its reliance on Qualcomm where possible. Acquiring Broadcom would leave Qualcomm on its own, still stuck in a messy dispute with the world’s most valuable public company. But buying Broadcom would be, by far, Intel’s largest acquisition in its history. Its largest to date is its $16.7bn acquisition of programmable chip maker Altera, followed by the $15.3bn purchase of car vision company Mobileye last year. Broadcom’s Qualcomm acquisition is far from guaranteed, however, with significant roadblocks in the way of the hostile takeover. Perhaps foremost amongst them is that The Committee on Foreign Investment in the United States (CFIUS) could block the sale altogether, with the inter-agency committee citing national security matters. Among its concerns are that, by financing the acquisition with some $106bn in debt, Broadcom will be forced to slash R&D spend, namely in 5G technologies. This would leave the market open to dominance by Huawei, a Chinese corporation that has increasingly been targeted by the US over alleged ties to the Chinese state. 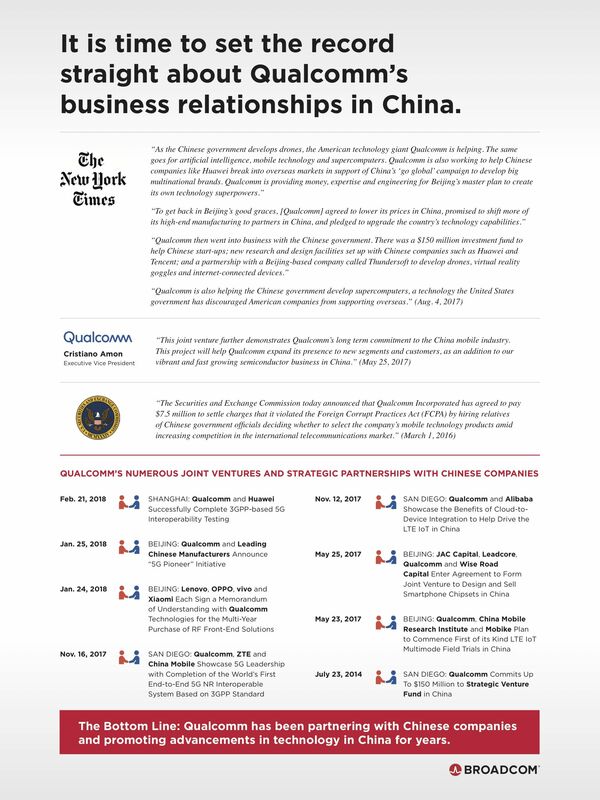 It has also said that it would not sell “any critical national security assets to any foreign companies,” while running infographic adverts claiming that Qualcomm currently has a close relationship with the Chinese government. Qualcomm, meanwhile, has accused Broadcom of “trivializing” national security. Adding further to the complexity of the attempted acquisitions is Broadcom’s plan to redomicile in the United States, from its current home in Singapore. The move could minimize CFIUS’ power, with the body regulating foreign investments. CFIUS has also delayed Broadcom’s acquisition of Brocade. Broadcom CEO Hock Tan announced the proposed move last November, at an event held in the Oval Office of the White House featuring President Donald Trump. Shareholders will vote on the potential move on March 23, which will be in the midst of the CFIUS panel’s decision process. CFIUS’ involvement was also used as rationale by Qualcomm to delay a vote on its board of directors from Tuesday, 6 March, by a month. Broadcom hopes to replace the majority of the board’s members to help it succeed in its acquisition attempt, while Qualcomm has made moves to maintain its board’s independence. Finally, Qualcomm’s attempted acquisition of NXP also faces regulatory hurdles - mainly in China. The nation’s Ministry of Commerce (MOFCOM) is still reviewing the acquisition, and recent moves by the US government to impose trade tarrifs on Chinese steel and aluminum could complicate matters. “Relative to QCOM/NXPI, which remains held-up by one final regulatory approval – MOFCOM, we wouldn’t completely rule out Trump’s protective trade rhetoric having unforeseen consequences to the elongation of MOFCOM’s approval process (certainly more so than MRVL/CAVM),” Cowen & Co.’s senior research analyst Karl Ackerman said, Barron’s reports.